E-nabling The Future provides everything you need to download and 3D print a self-assembly mechanical hand – meaning anyone can make the sort of prosthetic device that used to cost tens of thousands for as little as $50. The e-NABLE community, formed in 2013, is the outcome of an unlikely collaboration between a carpenter in South Africa and a puppeteer in America. When carpenter Richard Van As lost four fingers in an accident at work in 2011, he was unable to afford a factory-made prosthetic. So he hit the web. Inspired by a YouTube film of a giant mechanical hand with fingers that bent using steel cables for tendons that had been made for a scifi show, he got in touch with its maker to see if collaborate on a homemade mechanical hand that would work along similar lines. Special effects maker Ivan Owen, 10,000 miles away, agreed. A year later, the pair had a prototype. When the mother of a five year old who had been born without fingers asked them to make something similar, they realized that they had a potential solution for millions of children born with upper limb differences. In a few days they developed a crude mechanical hand with fingers that opened and closed. But Owen wondered if they could speed things up even further, by turning the hand into parts for 3D printing. He got in touch with MakerBot who donated a 3D printer to each of them – and hey presto: a complex hand-machining process was replaced by a hand-making machine! While a lower jaw had previously been made with 3D printers, Owen and Van As were the first to attempt to use the new technology to make prosthetic hands. Owen and Van As shared the design files for free online, so anyone could make their own cheap prosthetic, and improve on the design. Some months later Jon Schull from the Rochester Institute of Technology named and founded the e-NABLE community by creating an online map to match volunteers with hand-wanters. 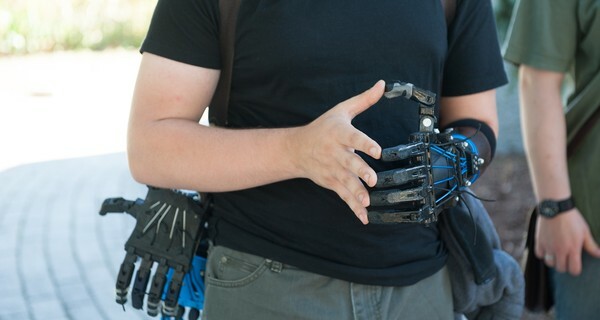 Today, numerous websites, online collaboration communities, and a conference at Johns Hopkins Medical Center has helped thousands of volunteers create ever-better hand and arm designs, and deliver hundreds of devices to recipients all over the world. In the future, the community plans international initiatives and workshops, educational materials, and Hand-o-Matic software for public libraries and maker spaces that let help anyone with a web-browser make inexpensive life-changing adaptive devices.